The band Queen, like their namesake, exude brilliance, radiance, and exhilaration in every one of the songs they produced. Their song Bohemian Rhapsody brought their energy and the definition of rock to a whole other level. So, it is only fair that the movie Bohemian Rhapsody is set to the high standard that Queen has been passing since the early 70s. And they definitely did not disappoint. Bohemian Rhapsody is about not only the making of the song, but many others, and touches on the lead singer, Freddie Mercury’s life. Freddie, played by Rami Malek meets Brian May (Gwilym Lee) and Roger Taylor (Ben Hardy) in the back of their van, asking to join them when he finds that their lead singer quit. With all the amount of jauntiness Freddie Mercury can have, he sang with his amazing vocal range, leaving them absolutely stunned, and said “I’ll consider your offer,” before walking away. They meet their bassist John Deacon (Joseph Mazzello) not soon after and the rest is history. As the story goes on, you could see Freddie going through various milestones with his love life, his bisexuality, his loneliness, and his finding of his family that was right there with him the entire time. In simplicity, the movie shows the great rise and fall of Mercury, in a way that he deserves. Mary Austin (Lucy Boynton), Freddie’s eventual fiance, is one of the most prevalent people in the film. Mercury and Mary’s beautifully written love story is shown, how they meet, how he proposes, how she leaves, and how she helps Freddie get back on the right path after he pushes everyone away. Mary will always be known as the love of Freddie’s life. Whether it is shown in tandem or not. Freddie Mercury’s bisexuality is tastefully revealed little by little as you can see how he comes to terms with it early in the movie. Mercury coming out to Mary was as gut-wrenching to watch as it was thrilling to see him accepting himself later on. The start of Freddie’s relationship with Jim Hutton is sweet as it is simple, Freddie only coming to Jim after he accepts himself for who he is, not his band persona. The movie shows the issues with Paul Prenter (Allen Leech) as he takes advantage of Mercury’s disconnect with Queen and manipulates him to push them out of his life and go into a very dark state of drugs, drinking, and loneliness. But, Freddie eventually rises up from all of the darkness in his life and cuts it out. Mercury’s diagnoses with AIDs is tragically revealed only after Queen finally comes together again. The heart-breaking line “I don’t want to die” sung by Freddie in the title song gave those lines new meaning as it is learned almost right before the Live Aid concert that he has the disease. It is said many times that Freddie did not want to become the poster boy for AIDs, and that is certainly not what he had become. However, with this movie, there is no doubt that he has inspired many younger generations, not because of his death, but how he lived, and how he bright he shone. 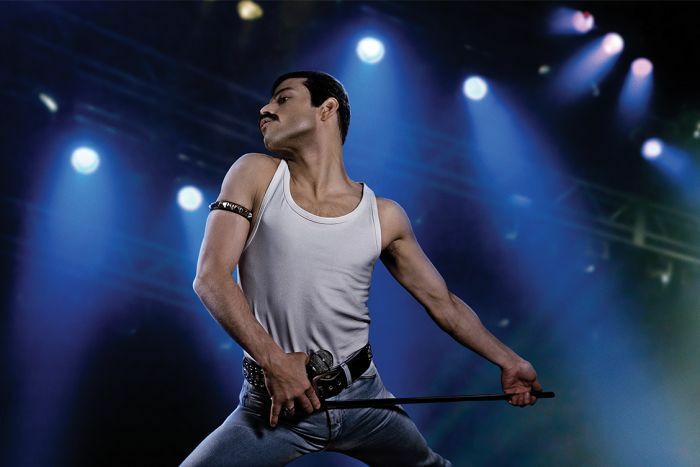 Most importantly, Freddie got to decide how he was portrayed: as a revolutionary performer. Even though the screen, Rami Malek captures Mercury’s ability to rile up a crowd with seemingly perfect ease and great passion. You could hear the theater singing along to the beautiful regeneration of the Live Aid concert from start to finish. Old fans who were there the day Wembley Stadium went live and new fans who just discovered classic rock all laughed and cried, bringing together people who don’t belong together singing the lyrics of an ageless band. At first, critics penalized the movie, saying it was too rushed or fast-paced, but the movie flowed smoothly as one could when recounting more than a decade of someone’s life. But just like the movie got mixed reviews, so did Bohemian Rhapsody when the song was first released. In both instances, the fans quickly shut down the critics, giving Bohemian Rhapsody amazing reviews and a kindling of the love for the band that was always there. The making of the song Bohemian Rhapsody started with Queen wanting to do something more. More than rock, more than anything they’ve ever done, than anyone’s ever done. Bohemian Rhapsody did all of that and more. The movie not only did Freddie Mercury justice, but it also cried out to both long time and new fans. The cry bouncing off the walls of the theater: the show will always go on.